Some astute signings especially Oss. Tusveld a shrewd acquisition imo. A good move for Theuns. Too many youngsters in the climbing dept? Can't say I noticed the team that much this year and that's even with Kanter being in my CQ team. A work in progress. Hirschi is a great signing. The young Germans did alright in the Bundesliga, Kanter is U23 . I suppose they'll improve further next year. Tu must have been recommended by Bennekou ... He hasn't exactly turned heads in Denmark so far, but they must see something in him. And it doesn't hurt that Giant is from Taiwan, either, I guess! In 2018, we will reduce our rider roster from 29 riders to 24 riders which is aligned with our race calendar and the reduced number of riders per team at certain races next year. We are saying goodbye to a number of riders who are moving on or retiring, many of whom have been with BMC Racing Team for quite a few years. I want to say thank you to these riders and wish them all the best in the coming years. We are excited to welcome four new riders to the team: Alberto Bettiol (ITA), Patrick Bevin (NZ), Simon Gerrans (AUS) and Jürgen Roelandts (BEL). Call me naïve, but - who is Magic? Call me Naive. Mikel Naive. Aguirre the other new signing along with Mancebo. Trentin and Nieve are great signings. I also thought Tivani had renewed. so with the merger, GM brings a sponsor + Marco Tizza. That's it. 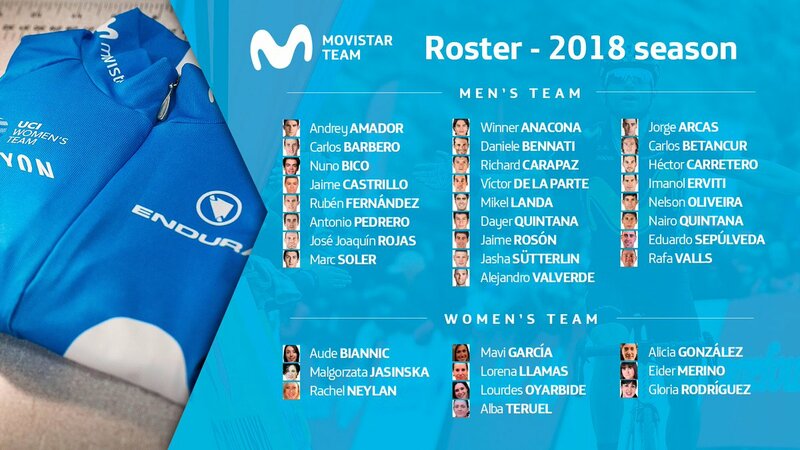 There will be a new U23 team though, so I most of their young guys are likely to end up there. Lander goes back to Denmark, and Parrinello should get a deal somewhere, I guess - although it's a bit of a surprise to me, that he didn't make the cut. Parrinello should get a deal somewhere, I guess - although it's a bit of a surprise to me, that he didn't make the cut. We have to make sure he ends up on a Sibiu team. we need Raileanu anyway, don't we? Tivani has renewed and they have also signed Jurado who had quite a good year in Spain. Lizde changed his mind and has signed for #holdsworth instead. While it's fairly safe for the moment to assume that Axeon and Holowesko are going PCT purely for California, Rally might just have loftier ambitions. One nugget of info that I found out the other day is that both Rally and UHC (the sponsors not the teams) are now under the umbrella of one company - UnitedHealth Group bought Rally Health this year. The article I read it in suggested they merge and form a potential new WT team, but if it was me I'd just ditch UHC and put the extra money in Rally. If one desired, one could arguably make a case that & were, if you follow the money far enough, "teams with the same [...] main partner" who "may not compete in the same race". However, the same could be said for & - LottoNL acquired the Statsloterij last (?) year and renamed it to Nederlandse Loterij. And these teams race against each other all the time. There are other examples, such as the Belgian lotto being main sponsor of ... but also a sponsor of , prominently displayed on the left sleeve. Maybe the UCI just hasn't the resources to look into anything but the most egregious cases of this. For 2017 they prohibited participation in the same races of BORA-hansgrohe & Team Auto Eder Bayern as well as FDJ & bTwin U19 ... both Team Auto Eder Bayern and bTwin U19 are junior teams. I know of no instance when junior teams would be allowed to participate in senior races regardless of any affiliation with WorldTour teams. Now an Italian registered team.